OK everyone. I am a complete newbie, so bear with me. This is my 3rd day playing on my cnc. Im working on setting up Mach 3 still, but its not nearly as intuitive in some aspects as I would have hoped. Im on a DIY 3 axis machine with a 2'x4' cutting area. I have mach 3 setup to stop for tool changes and it stops the program and the LED (not sure I would call it that, but MACH does) flashes yellow. I then have to jog the router over to where I can actually change the tool (is there a way to setup where it jogs to me for this?). Once I get my new tool in, I have to re zero the Z axis because the tool is a different length. I assume this is fine and just re- zero the Z to the top of my part and jog it back up out of harms way. But, after I restart the program by clicking cycle start the new tool seems to randomly assume a new X 0 too. I haven't zeroed the x axis out, but the original x 0 is gone and a new one appears. Ive had this had 3 times on 2 different 3d parts that I have been trying to cut. I haven't successfully cut a part with multiple tools yet. Enter the tool change location on the settings page, and it should move there automatically. At what point does the X lose position? Does the DRO show the correct position? Thanks for the tip on tool change setting. Ill be sure to incorporate that tomorrow when I try again. The DRO shows X correctly after I have finished the tool change (example x= 3.6). Once I click cycle start, the DRO shows X=0 at some point before the X begins to move and my original DRO is lost. The cuts have then shifted right (positive X) by whatever amount the DRO randomly resets itself at. At first, I thought I must have been clicking to rezero the DRO, but its happened 3x in a row. I called it quits for tonight after having the same issue occur repeatedly and destroy my workpiece over and over. The 2nd and 3rd time I was aware of the possible issue and was very cautious with what I was doing. Im going to chalk it up to being a newbie still. I have enough trouble cutting my spindle back on manually, watching cut depths, keeping calm, and keeping the mouse over the RESET. Ive got to get and E stop setup along with a few relays soon. Im in the stone age of CNC still..
Can you attach your xml and also if you look in your macro folder then the folder of the profile you use can you attach the tool3.dat. Normally just hitting a rezero button while running a program is NOT a good idea. It is best to run a ROUTINE to do the official offsetting of the tool even IF you do it manually. Jogg to a reference point touch off then run an offset routine to let mach know exactly what you are needing to do. Also check the tool table to make sure there is NOT an offset present for the tool # you are using. IF it is you are double dipping on the offsetting. You can also setup a tool change position so that mach will jogg to that location every tool change. Check the manual. I have solved a few of my issues and came up with some more. I solved the X jumping issue. It was in fact a tool offset for tool 4. It was an offset of x=-2.4" No wonder I was having issues. I have no idea where it came from because finding it was the first time I went in the tool offsets screen. (DOH!) I decided to follow the advice of users here and am thankful I have so far. Its silly how dumb we can be and overlook the very basic stuff, but its not surprising to me at this point. Mach 3 still has me overwhelmed and I am not sure why. The cam/cad software is easy. Building the machine, wiring it and a new breaker, aligning the axis', and everything else was a breeze. Once I started the program, it ran fine. Then, during the tool change stoppage. I clicked the tool change pos. button located on the program run menu. Nothing happened. I then tried the return button. Still nothing. What I am doing wrong here? Are you using the standard 1024 screen? I don't see a tool change position button?? I have no idea what screen it is. Here is a screen shot. I have considered venturing into some of the other screens as I have seen a blue screen I like on one of the auto zero DIY tools on CNCZONE. But, Im not about to start worrying about how pretty something is when I cant even get the basic functions right. Im really good at scouring through forums for information and don't mind reading. If there is anything out there other than the videos and documentation from Artsoft, feel free to direct me to it. I got totally excited with 'Shiny new thing syndrome' and ended up way ahead of myself. Some reason I was more worried about the Cam software than I was the Controller software before I got everything together and am still trying to find which way is up in the few hours I can devote to learning each day. What version of mach3 are you using? I have the latest lockdown, and mine is different than yours. I may have changed it at some time in the past, though?? Anyway, go to Operator menu, and choose Edit Button Script. 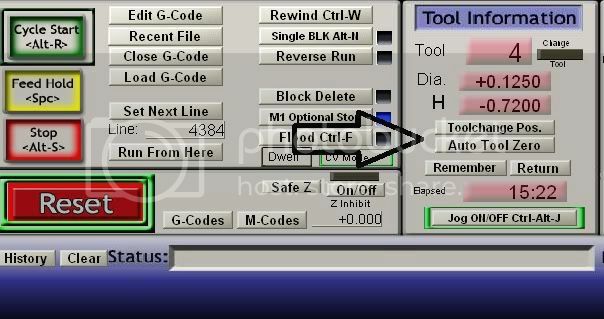 If the Tool Positions button is flashing, click on it, and when the editor opens, copy the code and paste it here. If it says none, then that's the problem. You may need to add some VB code to actually go to the position. You'll find that some of the toolchange functions need to be done by the user, as toolchanging is something that's different from machine to machine. Gerry, I believe this is "Big Tex's" screen set isn't it?